Cavasso red onions from Pordenone, are hard to find. Being a niche product grown in small quantities is not commonly found in the supermarket, I must point out this product for its significance in a world that is moving towards genetically modified products. First off, these are an ode to women. 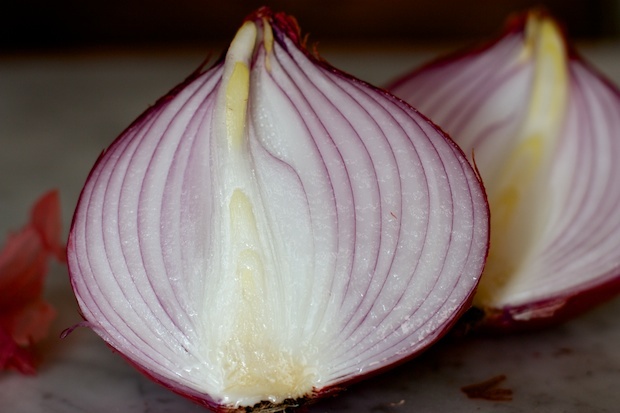 This onion was handed down thanks to the custom that every Italian mother knew. She would produce the seeds of this vegetable in an amount sufficient to enable her married daughter to sow the onions for the family in her garden. It was one of the many small actions of domestic economy that characterized all Italian women and perhaps the world, but that in reality rural foothill and mountain areas of our country represented in the hard years of the emigration of its people, a real guarantee of survival and progress before then. Add onions and potatoes, vegetables that are the most simple and obvious of our poor diet. However, I believe that without the onions the majority of our dishes would not exist. The onion according to its different taste and characteristics, allows preparations to tastes different. One must always understand what kind of onion one wants to use, considering that in Italy we are fortunate to have many varieties. Cavasso red onions are very good especially in recipes that require raw onions and in all preparations where the onion must enhance the dish and not overwhelm the flavors. Posted in Garden. RSS 2.0 feed.